London art dealer Anthony Stancomb and his wife, tired of the stress and turmoil of metropolitan life, discover the idyllic island of Vis and fall in love with it. Impulsively they sell their home and business, say farewell to their adult children and move to the island, but being the first foreigners to live on the island, the close-knit community is highly suspicious of them. The book charts their attempts to gain acceptance and the many rebuffs that they suffer. Their efforts often land them in very awkward (and sometimes hilarious) situations, but they persist and find themselves caught up in the bitter rivalries, love affairs and family dramas of the village. Through this they learn a lot about the islanders’ attitude to marriage, morality, health and death, and the effect that communism has had on everyone’s lives. The effect of communism and the recent civil war on the community is a theme that recurs throughout the book. After a few months they try to start up a restaurant and a vineyard, but those in the Town Hall continually thwart their attempts and they become so dispirited that they consider returning to England. But then Anthony makes a breakthrough discovery – that Nelson’s Navy occupied and played cricket on the island for ten years. In doing this he learns a great deal more about Croatian temperament – and then to the amazement of everyone, when the team play their first match, cricket clubs from all over the world hear about it and start asking for fixtures. Then, just when they thought all was well, a group of Mafiosi in league with the Town Hall open a nightclub and sleep is made impossible in the village. The islanders are too afraid to protest, so Anthony and Ivana are left to make a stand on their own, but despite the lack of support - and threats of physical violence from the Mafia - they tough it out, outwit the authorities and force the nightclub to close. This victory, combined with the team playing against the MCC (!) and Croatia being elected into the European 2nd Division, finally dispels all the past hostility and the couple feel accepted by their new community at last. As the book unfolds, the reader is shown the workings of an ex-communist society and sees how the locals are trying to adapt to Western ways. The book also follows the change that living on the island brings to the author and his wife, who by the end of this knockabout year, realise that thanks to the dents in their pride and preconceptions gained along the way, their whole outlook on life has changed. It is a book written to amuse, but the reader is given an incisive portrait of Croatia today and a heartfelt insight into a primitive island community and a way of life that the author, along with most of us, thought no longer existed. 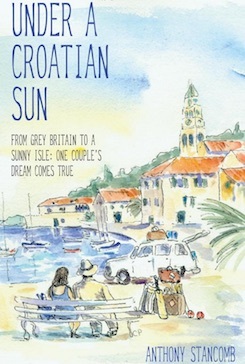 "Under a Croatian Sun is set to be 2014’s most charming and unusual memoir, the true story of a couple who move from London to the idyllic but rustic Croatian island of Vis, and the extraordinary tale of the formation of Croatia’s first cricket team.... For fans of Driving Over Lemons, Under a Tuscan Sun and A Year in Provence, this is a funny and heart-warming holiday read for people of all ages"
"Under a Croatian Sun is a light-hearted summer read that will whisk you straight to the sleepy shores of Vis. The perfect one to pack if you’re heading for a beach break or simply looking for a few minutes of escapism during your daily commute"
"This honest heart-warming account of wanting to succeed with a life they have long dreamed about is both humorous and thought-provoking. It is never easy to make a decision such as the one the Stancombs made but it just proves that hard work and determination lead to success. I would highly recommend this book to anyone considering a move to that long-lost Island in the middle of no-where or to anyone that has even a small amount of flight and wanderlust about them"
"...fascinating, humorous and totally believable read." "an endearing tale of the roller coaster ride of gaining some sort of acceptance against almost impossible odds.... a rare and enlightening insight into what living in a small village on a Croatian island is really like." " The world is full of adventures, great and small, and quirky interesting people and this book is packed with them. It lifts the spirit reading about it all and I highly recommend it." "charming true story of a couple who move from London to a rustic Croatian island. " "Full of acute observation, uncontrollable humour and a rousing climax." 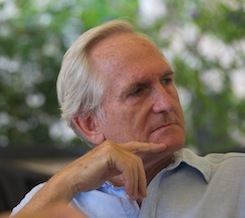 "To his credit Stancomb resists the stereotype of the closed-minded British expatriate." "A good read. I enjoyed best the humorous bits." "A wit, a sense of humour running throughout... full of adventures and quirky interesting people. It lifts the spirit. Forget Peter Mayle and Provence. Think Anthony and Croatia instead." "Hilarious. You won’t regret it! Five stars"
Anthony Stancomb’s memoirs of moving to the Croatian island of Vis Under a Croatian Sun: From Grey Britain to a Sunny Isle: One Couple’s Dream Comes True and Notes from a Very Small Island have been optioned by Life and Soul Pictures.